Designation: Department of Pharmacology, Institute of Biomedical Sciences, University of São Paulo, Av Prof Lineu Prestes. List of Author(s): De-Oliveira RBB, Kato EE, Cirillo MC, De-Lima TS, Alba-Loureiro TC, Curi R, Sampaio SC. Citation: De-Oliveira RBB, Kato EE, Cirillo MC, De- Lima TS, Alba-Loureiro TC, Curi R, Sampaio SC (2018) Crotoxin-Treated Macrophages Stimulate ROS Production and Killing Activity in co-cultured Neutrophils. J Appl Microb Res. Vol: 1, Issu: 1 (55-65). Copyright: © 2018 Sampaio SC, et al. This is an openaccess article distributed under the terms of the Creative Commons Attribution License, which permits unrestricted use, distribution, and reproduction in any medium, provided the original author and source are credited. Crotoxin (CTX), the predominant toxin in Crotalus durissus terrificus snake venom (CdtV), has anti-inflammatory and immunomodulatory effects. Despite its inhibitory action on neutrophil migration and phagocytosis, CTX does not directly affect the production of reactive oxygen species (ROS) by the neutrophils. In contrast, it enhances the generation of reactive oxygen and nitrogen intermediates by macrophages. Given the importance of macrophage-neutrophil interactions in innate antimicrobial defense, the aim of this study was to investigate the effect of CTX on neutrophil ROS production and killing activity, either through CTX-treated macrophage co-culture or conditioned medium of CTX-treated macrophages. The results showed an important modulatory action of CTX on the neutrophil function as well as neutrophil-macrophage interactions, as demonstrated by the increased production of hydrogen peroxide, hypochlorous acid, nitric oxide and TNF- α , along with the increased fungicidal activity of neutrophils. Crotoxin, Macrophages, Neutrophils, Inflammation, ATP, Reactive oxygen and nitrogen species, Cytokines, Co-culture model. Macrophage-neutrophil interactions involve reciprocal activation of both cells [1,2] and play a key role in antimicrobial defense [2,3]. Neutrophils and macrophages have certain unique and complementary characteristics which allow them to cooperatively act as effectors and modulators of innate immunity [2,4]. The basic mechanism of macrophage-neutrophil co-operation is the transfer of microbicidal compounds such as ROS, RNS, and cytokines from the activatedmacrophages to the neutrophils, which modulate the latter’s response . Neutrophils produce higher levels of ROS than macrophages. In addition, other antimicrobial factors like myeloperoxidase are either absent or present in scarce amounts in the monocytes, which results in a less intense microbicidal capacity compared to neutrophils[1,5,6]. During an inflammatory response against pathogens, co-operation between macrophages and neutrophils improves ROS production via the NADPH oxidase complex, and also increases the amounts of reactive nitrogen species (RNS), particularly nitric oxide (NO), leading to the formation of more potent antimicrobial molecules like peroxynitrite [3,7]. Macrophage-neutrophil interaction also involves the participation of PRRs (PAMPs receptors) that are expressed on both cells , and is mediated by cytokines such as IL-8, CCL2, IL-1 β and TNF- α [9,10] which further amplify the inflammatory response . Several studies have characterized the anti-inflammatory and immunomodulatory potential of Crotoxin (CTX), the main toxic component of the Crotalus durissus terrificus snake venom [12-15]. First isolated by Slotta and Fraenkel-Conrat in 1938 , and structurally elucidated by Fraenkel-Conrat and Singer in 1956 , CTX is a β -neurotoxin heterodimer formed by non-covalent association of two different subunits–crotapotin (CA) and a phospholipase A2 (PLA2- CB). Sixteen different isoforms of CTX were identified as a result of randomized combinations of the CA (CA1, CA2, CA3, and CA4) and CB (CBa2, CBb, CBc, and CBd) isoforms. The combinations of these isoforms form different complexes with different biological and pharmacological properties . Both in-vivo and in-vitro studies have shown the dual effects of CTX on macrophage functions, such as inhibition of macrophage spreading and phagocytosis, and stimulation of H2O2 and NO production and release [13,19]. These changes are accompanied by increased activity of the key glycolytic enzymes and higher consumption of glucose and glutamine, which demonstrates the metabolic effects of this toxin . CTX also enhances the production of ROS, RNS, and cytokines in macrophages, thereby inducing the M1 or inflammatory phenotype, and enhancing their antitumor and anti-leishmanial properties [13,14]. In contrast, CTX inhibits both migration and phagocytosis of neutrophils induced by flogistic agents such as carrageenan or FMLP, and downregulates the Syk-GTPase pathway [15,21]. This inhibitory effect of CTX on neutrophil functions contributes to its anti-inflammatory role that has been previously reported [12,15]. In addition, and in contrast to what has been observed for macrophages, CTX does not affect neutrophil metabolism (i.e. production of ROS induced by PMA) nor its microbicidal activities as seen in a model of peritonitis induced by carrageenan . Since the CTX selectively stimulates macrophages, and the interaction between macrophages and neutrophils results in reciprocal stimulation, the question arises as to whether inflammatory macrophages treated with CTX are capable of altering the metabolism and function of cocultured neutrophils. Therefore, the aim of the present study was to investigate whether the CTX induced macrophage activation induces a more potent fungicidal response by the neutrophils. We were able to demonstrate an enhanced in-vitro fungicidal activity of neutrophils against Candida albicans after co-culturing with CTX-treated macrophages. Our findings highlight the potential of this toxin in studying the mechanisms involved in the genesis of the inflammatory response, and in the regulation of neutrophils and macrophage interactions in innate immunity. Male Wistar rats weighing 160-180 grams were used in this study. All animal experiments were performed in accordance with the guidelines for animal experimentation, and the Ethical Committee for the Use of Animals of the Butantan Institute approved the protocol (CEUAIB, protocol number 832/11 and 1013/13). Crude venom solution was subjected to anion-exchange chromatography as previously described by Rangel-Santos et al. using a Mono-Q HR 5/5 column in an FPLC system (Pharmacia, Uppsala, Sweden), and different fractions (1 mL/min) were eluted using a linear gradient of NaCl (0-1 mol/L in 50 mmol/L Tris-HCl, pH 7.0) . Three peaks (p1, p2 and p3) were obtained of which p2 corresponded to the pure CTX fraction (about 60% of the crude venom), and peaks 1 and 3 included the other CdtV toxins. Prior to pooling, the fractions containing CTX were tested for homogeneity by non-reducing SDS-PAGE (12.5%)  and the phospholipase A2 activity was assessed by a colorimetric assay using a synthetic chromogenic substrate, as previously described by our group [13,19,25,26]. As per the recommendations of the Animal Ethics Committee Protocols (832/11 and 1013/13), the rats were euthanized in a CO2 chamber and their peritoneal cavity was opened and washed with 10 mL cold phosphate-buffered saline (PBS) pH 7.4. After gently massaging the abdominal wall, the peritoneal fluid now containing the resident macrophages was aspirated. The total number of peritoneal cells was counted and differential counts were performed on smears stained with a panchromatic dye . The samples from individual animals were used for all the measurements. The assays were always performed in duplicate as described in our previous studies [13,19,25,26]. Peritoneal exudates were obtained as described previously by our group . The rats were injected intraperitoneally with carrageenan (Cg-4.5 mg/kg) (Sigma, St Louis, MO, USA) and euthanized four hours later. The peritoneal cavity was washed with PBS as described, and after a gentle massage of the abdominal wall, the peritoneal fluid containing neutrophils was aspirated. The total and differential peritoneal cell counts  indicated that 95% of the cells were neutrophils . Scheme of the experimental design. Figure 1: Scheme of the experimental design. The production of H2O2 was measured as described by Pick et al. , based on a horseradish peroxidase (HRP) dependent conversion of phenol red into a colored compound by H2O2. After 24 h of culture, the harvested neutrophils were re-suspended at the density of 4 × 106 cells/mL in phenol red solution (PRS) containing 140 mM NaCl, 10 mM potassiumphosphate buffer pH 7.0, 5 mM dextrose, 0.28 mM phenol red, and 8.5 U/mL HRP to a final volume of 7.4 mL with Hank’s solution. PRS solution was used as blanks, serial dilutions of H2O2 from 5 to 40 μ M were prepared in PRS for the standard curves, and neutrophil suspension with 100 ng phorbol myristate acetate (PMA) was used as the positive control. One hundred microliters of each solution were plated per well of a 96-well flat-bottomed tissue culture plate (Corning, NY®), and incubated in a humidified atmosphere at 37 °C for 1 h. The reaction was stopped by the addition of 10 μ L of 1 N NaOH. The H2O2 dependent phenol red oxidation was spectrophotometrically measured at 620 nm using a Titertek Multiscan apparatus. The concentration of H2O2 was expressed as nano-moles of H2O2 per 4 × 105 cells. Hypochlorous acid production (HOCl) was measured as described by Dypbukt et al. . After 24 h of co-culture, neutrophils were harvested and 4 ×105 cells were resuspended in 250 μ L of 5 mM taurine (Sigma) solution containing 140 mM NaCl, 10 mM KCl, 0.5mM MgCl2, 1 mM CaCl2, 1 mg/mL glucose and 100 ng/mL PMA, and incubated for 1 h at 37 °C under 5% CO2. To evaluate the basal production of HOCl, a PMA-minus control was included. The reaction was stopped by the addition of 20 μ g/mL catalase (Sigma), and the samples were immersed in an ice bath for 10 min. After centrifuging the samples, the supernatants were collected and 50 μ L of 2 mM 3,3′,5,5′-tetramethylbenzidine (TMB; Sigma) solution containing 10 μ M KI and 10% DMF in 400 mM acetate buffer pH 5.4 was added to each sample. After five minutes of incubation, the reduction of TMB was measured spectrophotometrically at 650 nm, against a blank solution consisting of 5 mM taurine solution. HOCl concentration was measured with the help of a standard curve and expressed as micro-moles of HOCl per 4 × 105 neutrophils per hour. Harvested neutrophils were re-suspended in 100 μL 1% Triton-X, and lysed by heat shock (alternating exposure to hot and cold temperatures three times) to release ATP. After centrifuging the lysates, 10 μ L of the supernatants were pipetted into each well of a flat white-bottomed 96 well plate (Corning, Costar). Serial dilutions of the ATP solution provided by the manufacturer were prepared for the standard curve. The ATP Determination Kit (A22066, Molecular Probes®) was used according to the manufacturer’s instructions. Briefly, 0.1 M DTT (dithiothreitol) was added to each well followed by 100 μ L of the 10 μ M luciferase/luciferin reagent solution. The release in ATP was measured for 10 min at 20 s intervals, at the maximum emission of 560 nm against the reaction buffer. ATP concentration was calculated with the help of the standard curve, and expressed as nano-moles of ATP per 1 × 106 cells, as described by Sakaki et al. .
For measuring NO production, the harvested neutrophils were re-suspended in fresh medium with or without C. albicans, and incubated for 4 h. Nitrite levels in the supernatants were measured as described by Ding et al. . Briefly, 50 μ L of each supernatant was incubated with an equal volume of Griess reagent (1% sulfanilamide, 0.1% naphthalene diamine dihydrochloride, 2.5% H3PO4) at room temperature for 10 min. The absorbance at 550 nm was measured against the cell-free medium containing 0.2-0.3 μ M NO-2 as blank. The nitrite concentration was determined with the help of sodium nitrite standard curves. To determine cytokine production, the harvested neutrophils were re-suspended in fresh medium with or without C. albicans and incubated for 4 h. Cytokines in the supernatants were quantified using ELISA as per the manufacturer’s instructions. Briefly, ELISA plates (Immuno Maxisorp; Nunc®, NJ) were coated with mouse anti-rat monoclonal antibodies (anti-TNF- α IgG1 Clone # 45418 and anti- CINC-2 IgG2b Clone # 123802) or polyclonal antibody (anti-IL-1 β ; R&D Systems, Minneapolis, MN), and incubated overnight at room temperature. After blocking for 1 h at room temperature, the respective samples and standards were added and incubated for 2 h. Biotinylated secondary antibodies were then added and incubated for another 2 h followed by a 20 min incubation with peroxidase-conjugated streptavidin. The color was developed using TMB in the dark for 20 min. The reaction was stopped with 2N sulfuric acid, and absorbance was measured at 465 and 590 nm in a microplate reader (Spectra Max 190, Molecular Devices). The cytokine concentrations were determined with the help of the standard curve prepared using recombinant murine cytokines (R&D Systems), with a detection sensitivity of 4-10 pg/mL. C. albicans (ATCC-9002-8) was cultured in 10% Sabouraud’s dextrose broth (Microbiology and Mycology Laboratories, Department of Clinical Analyses, Faculty of Pharmaceutics Science, University of São Paulo) at 30 °C for 24 h. The fungi were centrifuged, washed twice with Dulbecco PBS, and re-suspended at 2 × 107/mL. The viability was determined by methylene blue 0.05% (>98%) exclusion, and the cells counted in a Neubauer’s chamber. Phagocytosis and fungicidal activity were measured as described by Sampaio et al. and Lima et al. . Neutrophils harvested from the co-cultures or control monocultures (1 × 106 cells/ mL) were incubated in sterile plastic tubes (to avoid cell adherence) at 37 °C with C. albicans (4 × 106 fungi/mL) in RPMI 1640 medium supplemented with 10% FCS. After 40 min of incubation, 200 μ L of the neutrophil-yeast suspension were adhered onto glass coverslips by cytocentrifugation. The coverslips were stained with Wright’s and May-Giemsa, and the fungicidal activity was determined by assessing cell viability of phagocytosed particles by the dye exclusion test . The number of candidacidal neutrophils was scored as 0 (no Candida cells killed), 1 (1 or 2 cells), 2 (3 or 4 cells), and 3 (>4 cells). The index of candidacidal activity was calculated by the sum of the scores obtained per animal, as described by Sampaio et al. .
All statistical analyses of the differences between the groups were performed according to Glantz  using GraphPad InStat software, version 3.01 (GraphPad Software Inc., San Diego, CA, USA). A one-way analysis of variance followed by Tukey’s test was used for multiple comparisons (all pairs of groups) of values from the assays comparing the monoculture and co-culture groups. To analyze data of the other assays, ANOVA followed by Bonferroni’s test was used for multiple comparisons against a single control, and unpaired Student’s t-test was used to compare two groups. P values<0.05 were considered statistically significant. The results were presented as the mean values ± standard error. To determine the effect of CTX on ROS production, neutrophils, and macrophage mono- and co-cultures were treated with the toxin, and H2O2 levels were measured. Neutrophils co-cultured with LPS and CTX-stimulated macrophages (Neutr ϕ :Macr ϕ contact) or cultured with the conditioned medium collected from these macrophages (Neutr ϕ :CM-Macr ϕ contact) showed increased levels of H2O2 compared to neutrophils co-cultured with untreated macrophages (Figures 2A and 2B). In contrast, while CTX increased H2O2 production in macrophages (Figure 2C), it did not stimulate H2O2 production by neutrophil monocultures under the same conditions (Figure 2D), thus corroborating our previous data . Release of hydrogen peroxide by neutrophils co-cultured with CTX-treated macrophages. The release of H2O2 was measured in neutrophils (4 × 106 cells) co-cultured for 24 h with LPS-stimulated macrophages (4 × 106 cells/LPS-5μg/ml) that were pretreated with CTX (12.5 nM) for 2 h (Neutr ϕ :Macr ϕ ) (A) or in the macrophage-conditioned supernatant (Neutr ϕ :CM-Macr ϕ ) (B). In panels (C) and (D), the release of H2O2 was evaluated in monocultures of CTX-treated macrophages (Macr ϕ monoculture) and neutrophils (Neutr ϕ monoculture), respectively, maintained under the same experimental conditions. The assays were performed in quadruplicates and samples without PMA were evaluated to assess the spontaneous production of H2O2. The absorbance was determined in ELISA reader, with a filter of 620 nm obtaining the optical density (O.D.) and calculating the results in nmoles of H2O2 per 4 × 105 cells. The results express the mean ± e.p.m of three animals for each cell type and represent three different experiments. *P<0.001. Figure 2: Release of hydrogen peroxide by neutrophils co-cultured with CTX-treated macrophages. The release of H2O2 was measured in neutrophils (4 × 106 cells) co-cultured for 24 h with LPS-stimulated macrophages (4 × 106 cells/LPS-5μg/ml) that were pretreated with CTX (12.5 nM) for 2 h (Neutr ϕ :Macr ϕ ) (A) or in the macrophage-conditioned supernatant (Neutr ϕ :CM-Macr ϕ ) (B). 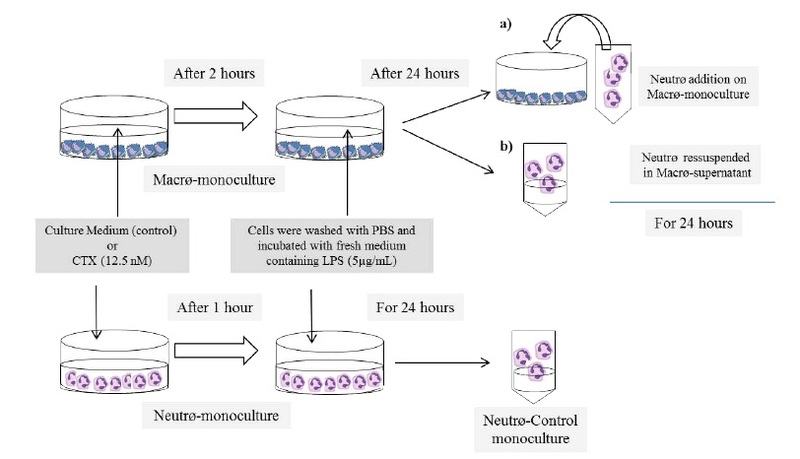 In panels (C) and (D), the release of H2O2 was evaluated in monocultures of CTX-treated macrophages (Macr ϕ monoculture) and neutrophils (Neutr ϕ monoculture), respectively, maintained under the same experimental conditions. The assays were performed in quadruplicates and samples without PMA were evaluated to assess the spontaneous production of H2O2. The absorbance was determined in ELISA reader, with a filter of 620 nm obtaining the optical density (O.D.) and calculating the results in nmoles of H2O2 per 4 × 105 cells. The results express the mean ± e.p.m of three animals for each cell type and represent three different experiments. *P<0.001. Neutrophils co-cultured with LPS and CTX stimulated macrophages showing the significant increase in basal HOCl production (38%), as well as that after PMA stimulation (76%) (Figure 3A). Similar effects were observed in neutrophils cultured with the CM from LPS and CTX stimulated macrophages (Figure 3B). However, CTX alone did not stimulate HOCl production by neutrophils (Figure 3C). Release of hypochlorous acid by neutrophils co-cultured with CTX-treated macrophages. The release of H2O2 was measured in neutrophils (4 × 106 cells) co-cultured for 24 h with LPS-stimulated macrophages (4x106 cells/LPS-5μg/ml) that were pretreated with CTX (12.5 nM) for 2 h (Neutr ϕ :Macr ϕ ) (A) or in the macrophage-conditioned supernatant (Neutr ϕ :CM-Macr ϕ ) (B). 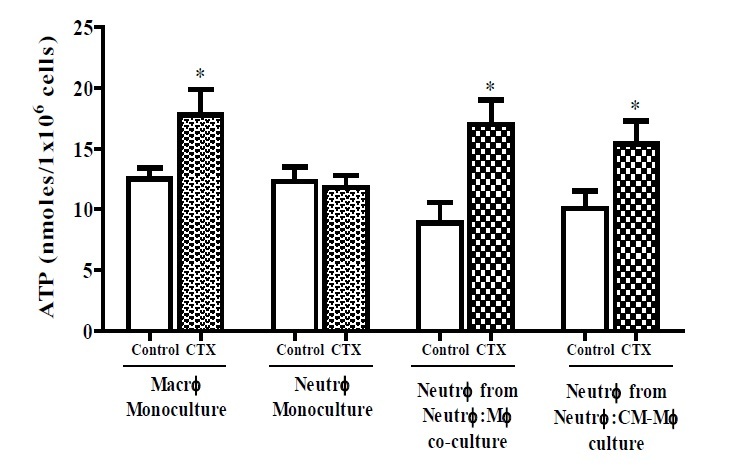 In panel (C), the release of HOCl was evaluated in monocultures of CTX-treated neutrophils (Neutr ϕ monoculture), maintained under the same experimental conditions. The assays were performed in quadruplicates and samples without PMA were evaluated to assess the spontaneous production of HOCl. The absorbance was determined in ELISA reader, with a filter of 650 nm obtaining the optical density (O.D.) and calculating the results in μ M HOCl per 4 × 105 cells. The results express the mean ± e.p.m of three animals for each cell type and represent three different experiments. *P<0.001. Figure 3: Release of hypochlorous acid by neutrophils co-cultured with CTX-treated macrophages. The release of H2O2 was measured in neutrophils (4 × 106 cells) co-cultured for 24 h with LPS-stimulated macrophages (4x106 cells/LPS-5μg/ml) that were pretreated with CTX (12.5 nM) for 2 h (Neutr ϕ :Macr ϕ ) (A) or in the macrophage-conditioned supernatant (Neutr ϕ :CM-Macr ϕ ) (B). 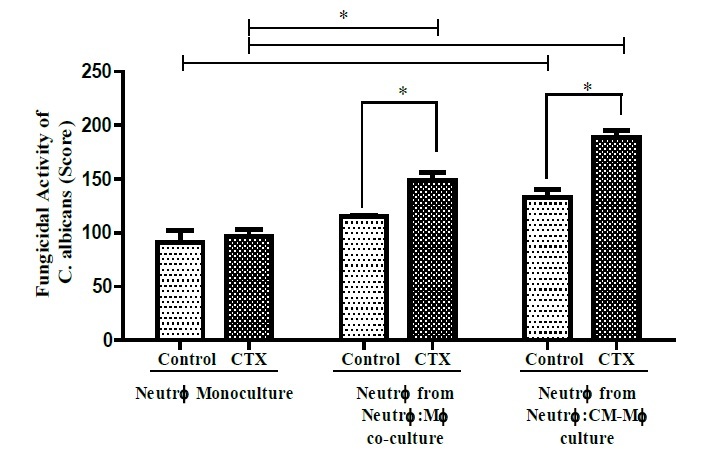 In panel (C), the release of HOCl was evaluated in monocultures of CTX-treated neutrophils (Neutr ϕ monoculture), maintained under the same experimental conditions. The assays were performed in quadruplicates and samples without PMA were evaluated to assess the spontaneous production of HOCl. The absorbance was determined in ELISA reader, with a filter of 650 nm obtaining the optical density (O.D.) and calculating the results in μ M HOCl per 4 × 105 cells. The results express the mean ± e.p.m of three animals for each cell type and represent three different experiments. *P<0.001. 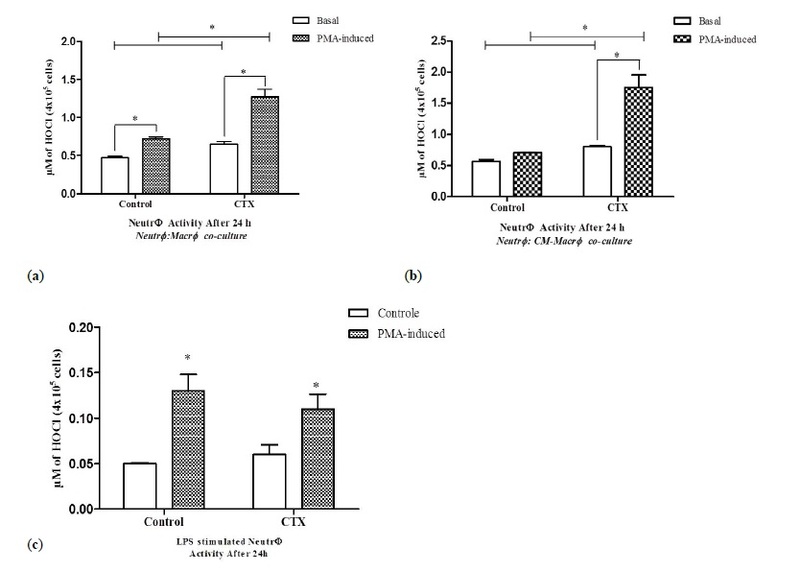 Neutrophils co-cultured with LPS and CTX treated macrophages or the CM of stimulated macrophages showed increased production of ATP by 52% and 42%, respectively (Figure 4). Macrophages treated with the toxin significantly increased ATP production by 91% whereas CTX alone did not affect ATP production in neutrophils (Figure 4). Release of ATP by neutrophils co-cultured with CTX-treated macrophages. Neutrophils (number) were co-cultured for 24 h with LPS-stimulated macrophages that were pretreated with CTX for 2 h (number, LPS dose, CTX dose) or in the macrophage-conditioned supernatant. Monocultures of CTXtreated macrophages and neutrophils were also analyzed, maintained under the same experimental conditions. The release of ATP was measured by an integration time of 10 min (20 s intervals) at a maximum emission of 560 nm and the results were expressed by a standard curve of extracellular ATP levels, in nmoles of ATP/1 × 106 cells. The results express the mean ± e.p.m of three animals for each cell type and represent two different experiments. *P<0.05, compared to the value of the respective control group. Figure 4: Release of ATP by neutrophils co-cultured with CTX-treated macrophages. Neutrophils (number) were co-cultured for 24 h with LPS-stimulated macrophages that were pretreated with CTX for 2 h (number, LPS dose, CTX dose) or in the macrophage-conditioned supernatant. Monocultures of CTXtreated macrophages and neutrophils were also analyzed, maintained under the same experimental conditions. The release of ATP was measured by an integration time of 10 min (20 s intervals) at a maximum emission of 560 nm and the results were expressed by a standard curve of extracellular ATP levels, in nmoles of ATP/1 × 106 cells. The results express the mean ± e.p.m of three animals for each cell type and represent two different experiments. *P<0.05, compared to the value of the respective control group. Neutrophils co-cultured with LPS and CTX stimulated macrophages or CM increased their fungicidal capacity by 30% and 42%, respectively, compared to CTX-untreated co-cultures. However, CTX did not augment the fungicidal activity of neutrophil monocultures (Figure 5). To determine the underlying mechanism of the higher fungicidal action induced by CTX, we evaluated the cytokine secretion and NO production in the suitable cultured neutrophils after a 4 h incubation with C. albicans. Fungicidal capacity of neutrophils co-cultured with CTX-treated macrophages. This activity was determined in neutrophils (number) obtained from monocultures or after co-cultured with LPS-stimulated macrophages that were pretreated with CTX for 2 h (number, LPS dose, CTX dose). The assay was determined by an exclusion staining test, in which only live intracellular yeasts are stained in blue. Live and dead yeasts were counted in a total of 100 cells and the results were expressed as a score. The results express the mean ± e.p.m of three animals for each cell type and represent three different experiments. *P<0.05. Figure 5: Fungicidal capacity of neutrophils co-cultured with CTX-treated macrophages. This activity was determined in neutrophils (number) obtained from monocultures or after co-cultured with LPS-stimulated macrophages that were pretreated with CTX for 2 h (number, LPS dose, CTX dose). The assay was determined by an exclusion staining test, in which only live intracellular yeasts are stained in blue. Live and dead yeasts were counted in a total of 100 cells and the results were expressed as a score. The results express the mean ± e.p.m of three animals for each cell type and represent three different experiments. *P<0.05. 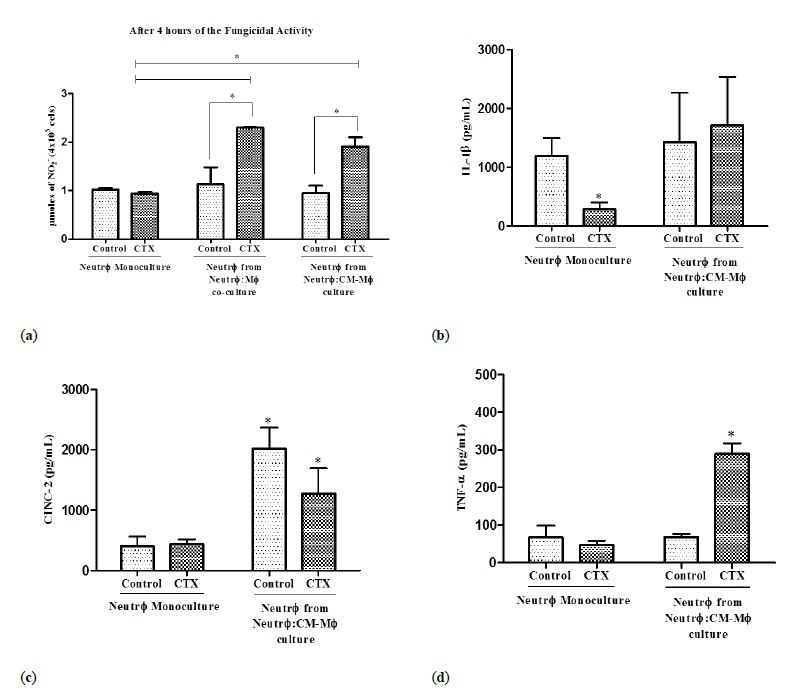 The neutrophils co-cultured with the stimulated macrophages or the CM showed increased NO production by 103% and 101%, respectively, while the CTX treated neutrophil monocultures did not show any change in NO production after 4 h of fungal exposure (Figure 6A). Interestingly, there was no change in the secreted cytokine profile of neutrophils after 24 h of incubation in the CMMacr ϕ stimulated with CTX and LPS (data not shown). However, since cytokines are modulated at the beginning of neutrophil-macrophage interaction during antimicrobial defense (Ref), we determined whether a shorter co-culture period between neutrophils and macrophages resulted in a distinct cytokine secretion profile during phagocytosis of C. albicans. 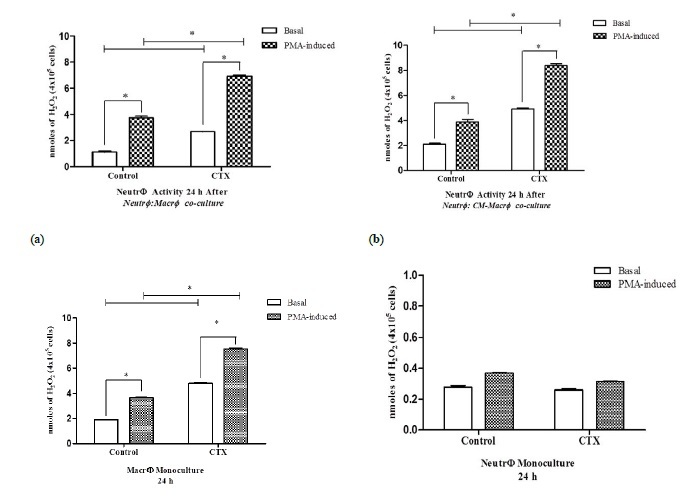 Neutrophils co-cultured for 4 h with stimulated macrophages showed no changes in the levels of IL-1 β and CINC-2 (Figure 6B and 6C), but secreted 4.25 higher levels of TNF- α during the candidacidal period compared to neutrophils co-cultured with unstimulated macrophages (Figure 6D). Cytokine production by neutrophils during fungicidal activity. Neutrophils (number) were co-cultured with LPS-stimulated macrophages pretreated with CTX (number, LPS dose, CTX dose) or in conditioned medium from these macrophages. In panel (A), NO production from Neutr ϕ monoculture treated or not with CTX and Neutr ϕ co-cultured with Macr ϕ or in M ø -CM pretreated with CTX. In panel (B, C, and D), cytokine production by Neutr ϕ monoculture treated or not with CTX, maintained under the same experimental conditions and by Neutr ϕ co-cultured with Macr ϕ or in M ø -CM pretreated with CTX. The assays were performed in triplicate. In the NO production assay, the absorbance was determined by an ELISA reader, at 540 nm. The results are expressed in μmoles of NO-2 per 4 × 105 cells. In the cytokine production assay, the absorbance was determined in an ELISA reader at 450 nm and calculating the results in pg/mL. The results are expressed as the mean ± e.p.m of three animals for each cell type and represent three different experiments. *P<0.001. Figure 6: Cytokine production by neutrophils during fungicidal activity. Neutrophils (number) were co-cultured with LPS-stimulated macrophages pretreated with CTX (number, LPS dose, CTX dose) or in conditioned medium from these macrophages. In panel (A), NO production from Neutr ϕ monoculture treated or not with CTX and Neutr ϕ co-cultured with Macr ϕ or in M ø -CM pretreated with CTX. In panel (B, C, and D), cytokine production by Neutr ϕ monoculture treated or not with CTX, maintained under the same experimental conditions and by Neutr ϕ co-cultured with Macr ϕ or in M ø -CM pretreated with CTX. The assays were performed in triplicate. In the NO production assay, the absorbance was determined by an ELISA reader, at 540 nm. The results are expressed in μmoles of NO-2 per 4 × 105 cells. In the cytokine production assay, the absorbance was determined in an ELISA reader at 450 nm and calculating the results in pg/mL. The results are expressed as the mean ± e.p.m of three animals for each cell type and represent three different experiments. *P<0.001. Based on the functional complementarity between macrophages and neutrophils, and on the distinct effects of CTX on the metabolism of these cells, the modulatory action of macrophages treated with CTX on ROS production and fungicidal activity of neutrophils was evaluated. Our results demonstrated that inflammatory neutrophils cocultured with LPS and CTX stimulated macrophages, or with the supernatant from these macrophages had increased metabolism and fungicidal capacity. In addition, CTX also intensified the metabolism of LPS-stimulated macrophages. Our data are consistent to the findings of Faiad et al. who demonstrated that CTX increased ROS and RNS production in both resident and tumor macrophages obtained from the peritoneal cavity of tumor-bearing rats. Therefore, we demonstrated that the stimulatory action of CTX on macrophage metabolism is independent of the stimulus involved. Several studies have demonstrated that LPS activates M1 macrophages to respond to injury , and are characterized by increased production and release of reactive oxygen and nitrogen species, compounds that are known to enhance neutrophil secretory capacity [37-39]. In fact, the co-culture of neutrophils with LPS-stimulated macrophages increased the latter’s inflammatory activity. In a previous study, our group demonstrated that CTX could not directly modulate neutrophil metabolism . However, the peculiar metabolic state of macrophages induced by CTX was able to alter neutrophil metabolism, and stimulate these cells to produce more ROS and ATP, and the latter in turn is known to increase the production of multiple inflammatory mediators like superoxide anion, hydrogen peroxide, nitric oxide, and cytokines, among others [40-42]. Therefore, the increase in ATP is an important parameter of neutrophil metabolism as well as activity. Our study has demonstrated for the first time the ability of CTX to induce ATP production in macrophages as well as in neutrophils co-cultured with the stimulated macrophages, without affecting the viability of either. This is consistent with the study of Faiad et al. who demonstrated the stimulatory action of CTX on glucose and glutamine oxidation in rat peritoneal macrophages, which led to an increase in ATP production . The findings of both studies reinforce the stimulatory capacity of CTX on the metabolism of macrophages and the importance of ATP in neutrophil activation during the interaction between these cells. Currently, our group is studying the mechanisms involved in CTX mediated activation of macrophages and neutrophils. The activation of neutrophils culminates in the production of NO and pro-inflammatory cytokines such as IL-1 β , IL- 8, and TNF- α, which further amplifies the interaction between neutrophils and macrophages during inflammatory responses against infections [1,44]. The fungicidal activity of neutrophils may involve a more modulated cytokine response. For example, TNF- α is quickly produced in response to C. albicans infection , which is known to activate macrophages and neutrophils by increasing their phagocytic capacity and production of ROS and RNS, which eliminate the invading pathogens . Therefore, we evaluated the production of cytokines and NO by neutrophils cultured with supernatants obtained from the CTX-treated macrophages as a measure of their fungicidal activity. The neutrophils showed a significant increase in TNF- α levels, which is consistent with previous data that show the appearance of this cytokine in the early stages of neutrophilmacrophage interaction during the inflammatory response against infections . Interestingly, the NO production was significantly increased in the co-cultured neutrophils during the fungicidal phase. Therefore, we hypothesize that the increase in TNF- α production may have contributed to the increase in NO production, which in turn enhanced the fungicidal ability of neutrophils. Peroxynitrite (ONOO-), a product of spontaneous NO and O2 fusion, is one of the most important oxidizing agents in various pathophysiological conditions, and could also be generated in neutrophils during CTX-treated macrophage co-culture, leading to increased fungicidal ability [48-51]. Our group has also recently demonstrated that CTXtreatment induced an M1 profile in macrophages infected with Leishmania, with increased ROS, NO, IL-6 and TNF- α production and without loss of viability , which is associated with a better prognosis for cutaneous leishmaniasis treatment. Lipoxins (LXA) and their lipid derivatives are potent stimulators of the microbicidal activity of macrophages and increase the levels of intracellular ROS [52-56]. Recent studies on both in vitro and in vivo models have shown a stimulatory effect of CTX on the production of LXA4 and its stable analog 15-Epi-LXA4, along with increased ROS and RNS production, in resident macrophages or those are the part of the tumor microenvironment [13,25,57]. Therefore, we hypothesize that these mediators secreted by CTX-treated macrophages, regardless of their activation state, may enhance the fungicidal capacity of co-cultured neutrophils. In fact, secretion of LXA4 and 15-Epi-LXA4, and anti-inflammatory mediators like resolvins and protectins, by macrophages in an infectious microenvironment regulate the inflammatory response by inhibiting neutrophil recruitment [58,59]. Therefore, if we consider the ability of CTX to stimulate both pro- and anti-inflammatory mediators, it is likely that the activation of neutrophils by CTX-treated macrophages would increase the fungicidal response without exacerbating local inflammation. In fact, the modulatory capacity of CTX can be attributed to its pleiotropic effects on different inflammatory mediators . Our study demonstrates for the first time that increased ROS production and fungicidal activity of neutrophils are associated with increased oxidative metabolism in CTXtreated macrophages. LPS-stimulated macrophages induce production of ROS, ATP, RNS, and TNF- α by neutrophils during the early stages of contact (H2O2 release from 1 hour of incubation - Figure 1 of the Supplementary Material), and the high levels are maintained for an extended duration (Figure 7). This could be relevant to the modulation of neutrophils during the infectious inflammatory response in-vivo. Scheme proposed for the increase in ROS production and killing activity of neutrophils associated with increased oxidative metabolism in CTX-treated macrophages. CTX enhances the ability of macrophages to produce oxygen and nitrogen reactive species, lipid mediators, such as LXA4 and stable analog, cytokines [as demonstrated in our studies (13,44,45)], and ATP (as demonstrated in the present study). These inflammatory mediators act as inducers of ROS, ATP, RNS and TNF- α production by neutrophils, amplifying the killing capacity of these cells. Thus, CTXtreated macrophages may be crucial to the activation of the neutrophils and control of the cooperative action between neutrophils and macrophages during infectious inflammatory responses. 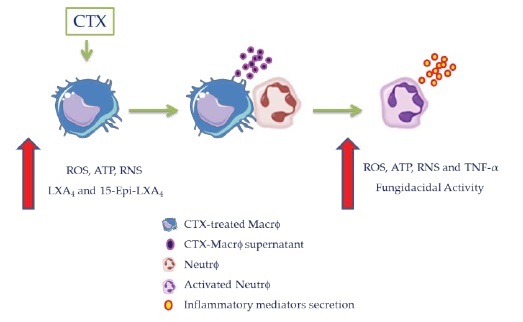 Figure 7: Scheme proposed for the increase in ROS production and killing activity of neutrophils associated with increased oxidative metabolism in CTX-treated macrophages. CTX enhances the ability of macrophages to produce oxygen and nitrogen reactive species, lipid mediators, such as LXA4 and stable analog, cytokines [as demonstrated in our studies (13,44,45)], and ATP (as demonstrated in the present study). These inflammatory mediators act as inducers of ROS, ATP, RNS and TNF- α production by neutrophils, amplifying the killing capacity of these cells. Thus, CTXtreated macrophages may be crucial to the activation of the neutrophils and control of the cooperative action between neutrophils and macrophages during infectious inflammatory responses. Therefore, this study contributes to the knowledge on CTX modulatory action on the inflammatory response and highlights once again the potential of this toxin for studying the mechanisms involved in inflammatory response vis-a-vis neutrophil and macrophage interactions in innate immunity. This work was supported by the grants 2009/52330-9, São Paulo Research Foundation (FAPESP) and 2008/57898- 0, Instituto Nacional de Ciência e Tecnologia em Toxinas (INCTTOX) and Guggenheim Foundation; fellowships 2012/08880-7, São Paulo Research Foundation (FAPESP) and Secretaria da Saúde do Estado de São Paulo (PAP-SSP), The authors would like to thank Mr. Andre Fonseca Alves for his valuable technical assistance with the purification of CTX. Conflict of interest: The authors declare that there are no conflicts of interest.